Nature Knights: Mt. 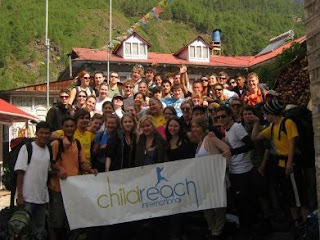 Everest Base Camp Expedition, Nepal for a Cause. Mt. 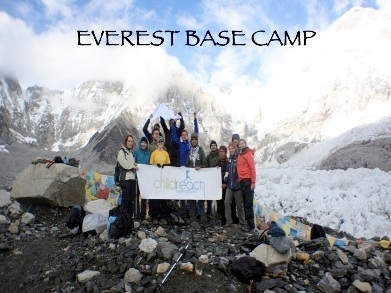 Everest Base Camp Expedition, Nepal for a Cause. Fundraising Challenge event organized by Childreach International, India. Pick-up at Tribhuvan International Airport, meeting with your guide and transfer to Potala Guest House. 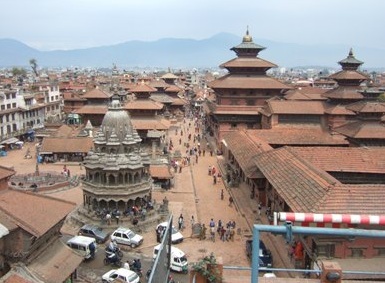 First impressions of Kathmandu – walk to medieval Kathmandu Durbar Square and explore the beautiful complex of palaces, temples, shrines and courtyards built by the ancient Nepali kings between the 12th and 18th century. We also discover Thamel - the vibrant tourist area with hotels, restaurants and outdoorshops.Briefing in Potala hotel where we will be discussing the technicalities of the trek.Sightseeing with private bus to Pasupatinah, the most important Hindu temples of Nepal with the sacred burning ghats located at the holy Baghmati river.In the evening you enjoy a welcome dinner at Nepali Chulo - www.nepalichulo.com.np. 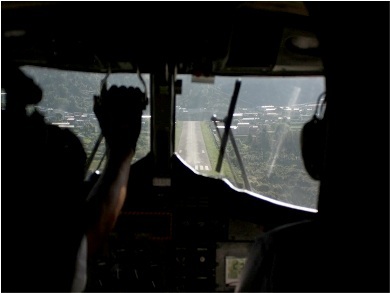 In the early morning we drive to Tribhuvan Airport to connect our fly to Lukla - flight time app. 40 minutes from Kathmandu. After breakfast in Lukla (2 850 m) we start trekking through beautiful settlements to join soon the main trail in Churi Kharka. We follow the east bank of the Dudh Koshi- the River of Milk- where you witness the typical Nepal terrace culture, slate roofed houses and views on Kusum Kangaru (5 579 m). We reach Phakding(2 640 m) after 3 - 4 h gentle walking. Today we make a challenging hike to Namche Bazaar (3 440 m), situated at 6-7 hours walking from Phakding. We climb up along the west bank of the Dudh Kosi to the tiny village of Toktok. We get our first glimpse of Thamserku peak (6 608 m) and reach Benkar (2 710 m). 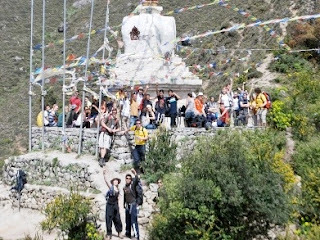 The cliffs above the village are decorated with huge paintings of Buddhist deities. 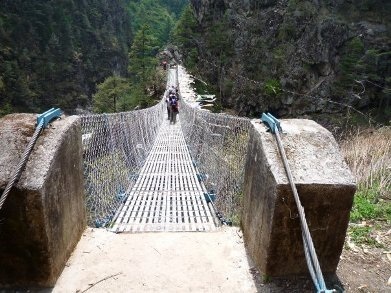 We cross the colorful suspension bridge and enter the Sagarmatha National Park at Monjo (2 840 m). 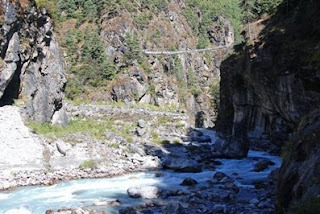 After Jorsale we follow the riverbank over gravel, climb through a pine forest and cross the Dudh Kosi by a big suspension bridge. Then we face a continuous zigzag ascent of 2 hours through dense pine forests. In the early evening we reach the vibrant center of Namche Bazar, one of the most attractive settlements of Solu-Khumbu district. Rest day in Namche. 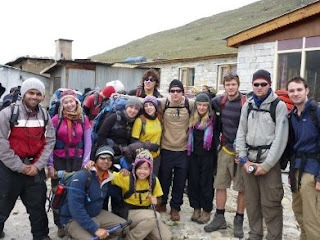 Optional walk to the Sherwi Khangba Sherpa Culture Museum or dayhike to the Hotel Everest View in Khumjung village (3 700 m) and Khundi Hospital in Khundi Village, the first hospital build in Khumbu Region by Sir Edmund Hillary and Himalayan Trust in 1966. Overnight stay at lodge Namche Bazaar. (6 783 m). Tengboche, is famed for the Buddhist Tengboche Monastery (where you can attend the daily puja), Cafe Tengboche and the view point. 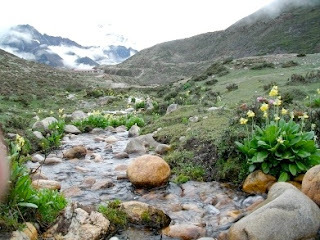 Rest day in DingbocheOptional acclimatization trek (5-6 hours) to the remote village of Chhukung (4 730 m) and Chhukung Ri (top) located at 5 550 m. We have magnificent sights at Island Peak (6 189 m), Amphulapche (5 663 m), Baruntse Base Camp (5 400m) and the white ice lake of Imja Tsho. Overnight stay at lodge Dingboche. The ascent to Gorak Shep (5 160 m) becomes steeper and rougher as we cross several moraines. Soon we see the peak of Pumori (7 145m). We also have our first views at Nuptse (7 864 m), Kala Pattar (5 545 m) and Mount Everest. 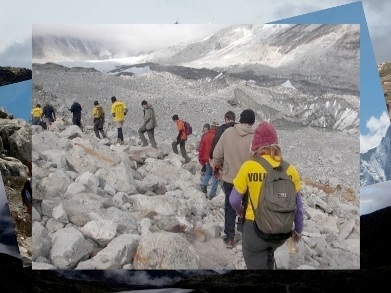 At the right side you look over the Khumbu Glacier, an enormous tongue of ice which marches down the slopes of Everest. We reach Gorak Shep by lunchtime and trek to Base Camp in the afternoon. In total we hike six-seven hours today. 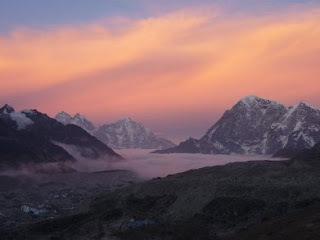 We sleep in a lodge at Gorakskhep, a semi-permanent village at the bottom of the Khumbu Icefall. We enjoy our Christmasdinner in the shadow of the highest peak of the world! Overnight stay at lodge Gorakshep. Overnight stay at lodge Pheriche. Overnight stay at Namche Bazaar. 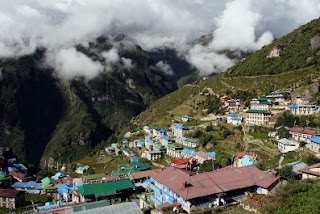 We start this 6 hours during trek with a streneous descent from Namche Bazaar to the Dud Kosi (hard work for the knees), after the path climbs up to Monjo and then runs easily to Benkar, Phakding and Lukla. Overnight stay at Lukla. Have Breakfast in the morning after breakfast volunteering session in one of the childreach international Nepal projects, where participants can actually have one on one interaction with the kids. In the evening we will be celebrating New year's eve in Kathmandu. Transfer to Tribhuvan Airport – We hope you enjoyed your stay! Please draw cheque or DD on the name of Childreach International India payable at Delhi. Payment option: By cheque or DD in favor of "Childreach International India" payable @ New Delhi. On twin or triple sharing basis as mentioned above. 13 breakfasts, 13 lunches and 13 dinners as mentioned in the itinerary. 1) Using coach for arrival and departure transfers, sightseeing, and excursions as per itinerary including transfer of baggage in the same transport or separately depending on the size of group. 2) Meeting and assistance on arrival/departure by representative. 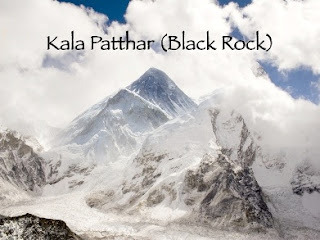 English speaking guide for sightseeing in Kathmandu and English speaking trekking guide for trekking. 2) Sagarmatha National Park entry fee. 3) Porters to carry personal baggage. 01 porter for every 3 persons. 4) Transportation and accident insurance for staffs and porters. 6) Medical (Due to accident any Hospital_nurshing home within the republic of Nepal), Maximum some insurance (US$ 10,000) per person. 7) Evacuation (Within the republic of Nepal), maximum some (US$ 10,000). Subject to the policies of Insurance company which will be provided during the contract with Insurance company. Personal expenses like laundry, communication, shopping and meals in Katmandu except welcome dinner and celebration party. 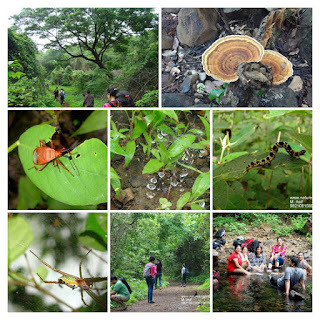 This Winter expedition is a challenge event organized by the Childreach International India (childreachindia.org). Contribution towards participation in the event will also serve social cause benefiting underprivileged children in India. Contribution to programs/ events organized by Childreach International India are exempted under section 80-G of the income Tax Act,1961. Cancellation Terms (Keep yourself posted for updates in Cancellation Terms)..
1. Cancellation charges upto 5 days from the date of the event will be 5% of the event cost. 2. Cancellation 4-3 days prior to the event will incur 15% of the event cost. 3. Cancellation between 3-2 days (72 hours to 48 hours) from the event will incur charges of 50%. 4. No refund if cancellation is <48 hours to the event. 5. We still want to be people friendly club, hence if you replace your seat with somebody else, there will not be any cancellation charges. 6. If for some reason BMC has to cancel the event, participants will refund 100% Refund.